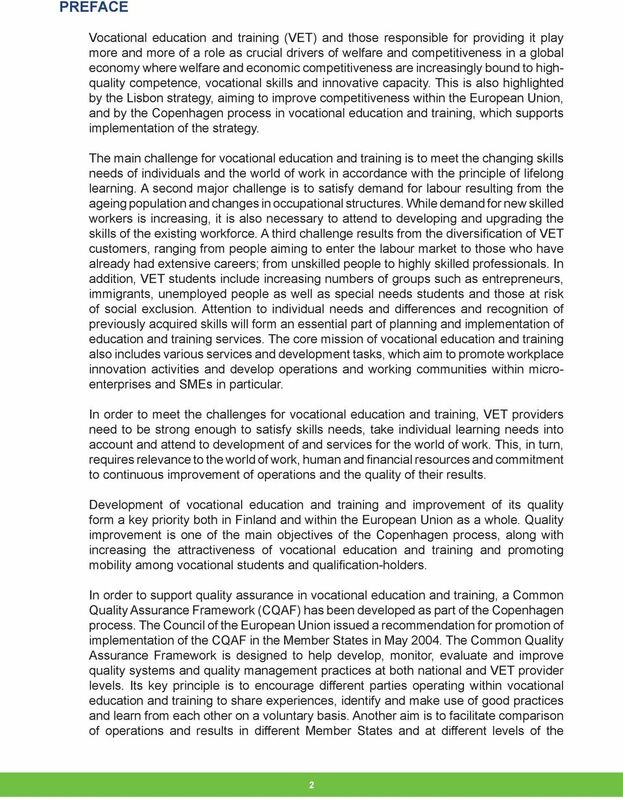 Download "QUALITY MANAGEMENT RECOMMENDATIONS FOR VOCATIONAL EDUCATION AND TRAINING"
3 education and training system. 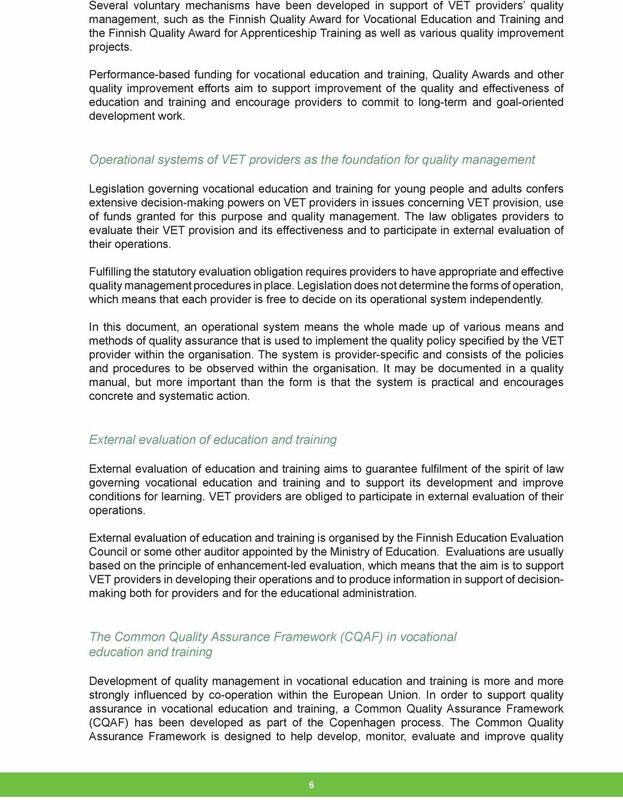 In addition, there is a European Network on Quality Assurance in Vocational Education and Training (ENQA-VET), which was established to promote development of quality assurance. 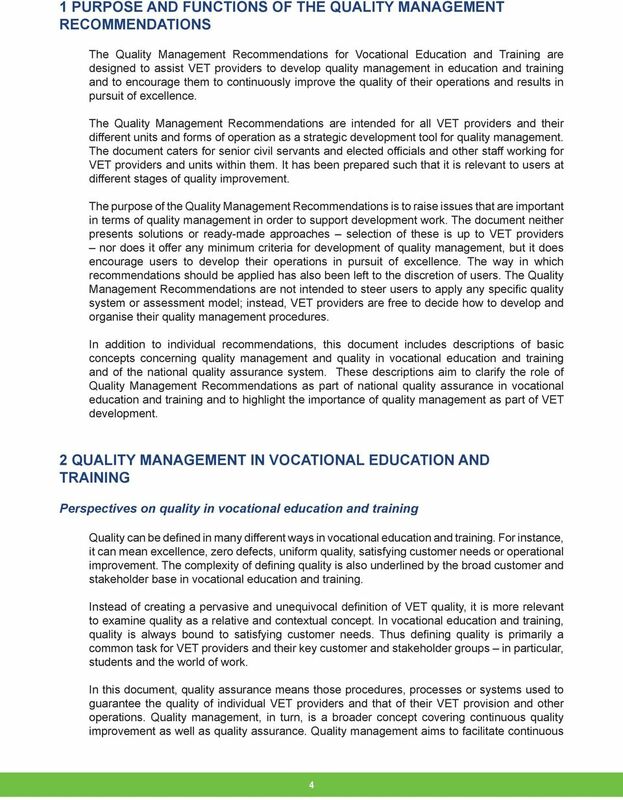 These Quality Management Recommendations for Vocational Education and Training have been adopted by the Ministry of Education to support and encourage VET providers to pursue excellence when improving the quality of their operations. The recommendations are based on the Common Quality Assurance Framework (CQAF) and form an important part of Finland s implementation of the Copenhagen process measures. 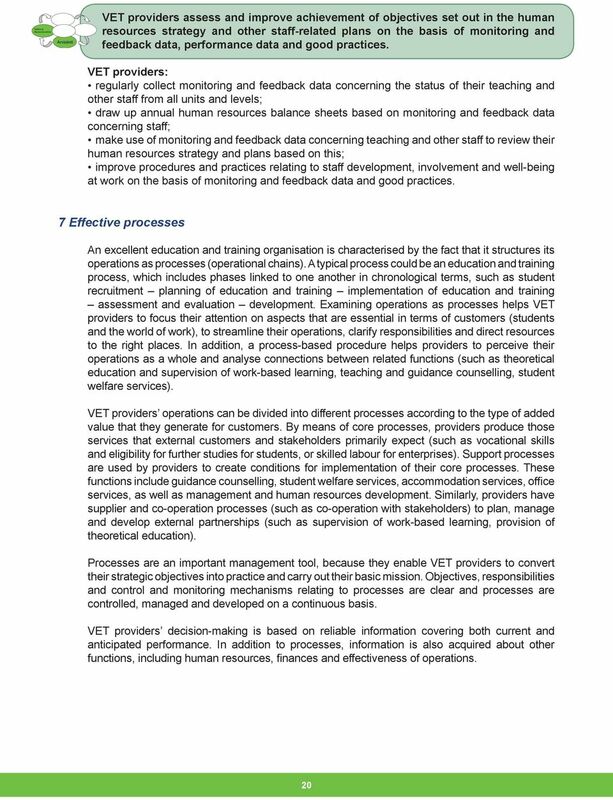 The document was drawn up by the Finnish National Board of Education working in co-operation with VET providers, representatives of the world of work and business as well as students. 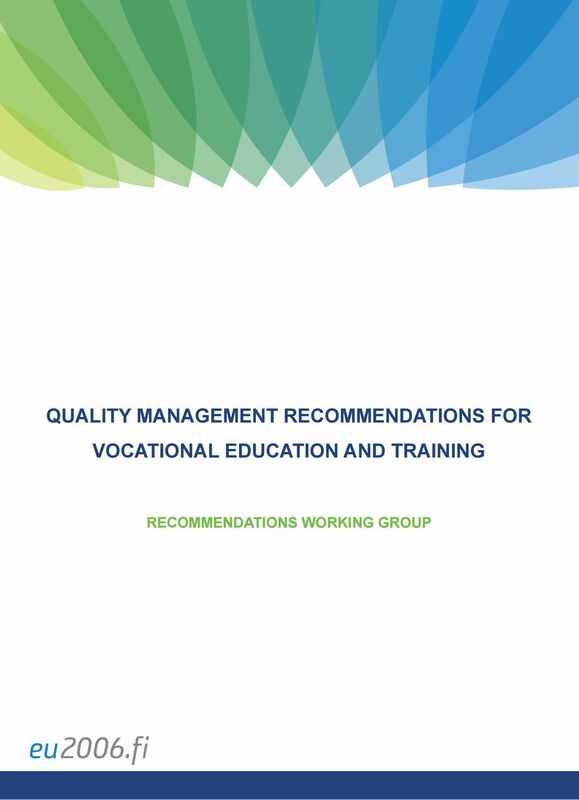 The Quality Management Recommendations have been designed such that they provide a foundation for long-term development of quality assurance in all types of vocational education and training. 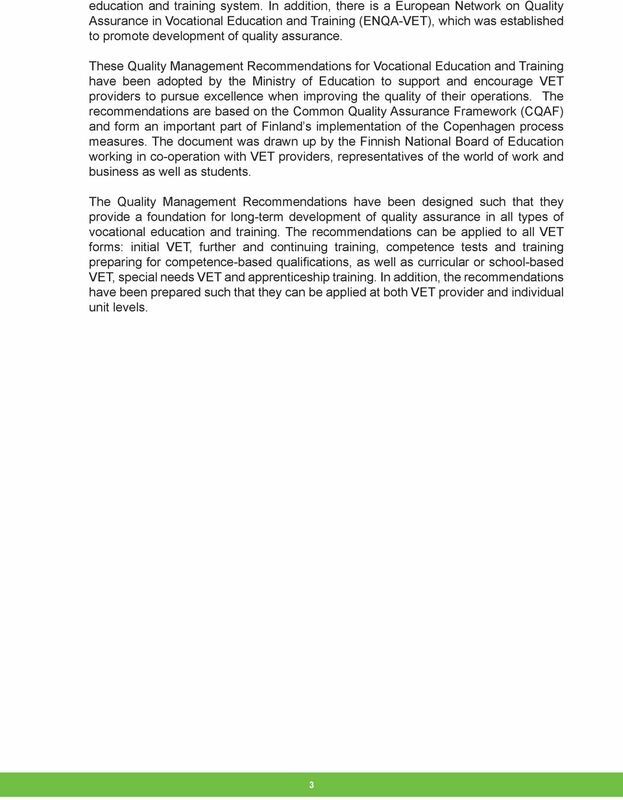 The recommendations can be applied to all VET forms: initial VET, further and continuing training, competence tests and training preparing for competence-based qualifications, as well as curricular or school-based VET, special needs VET and apprenticeship training. In addition, the recommendations have been prepared such that they can be applied at both VET provider and individual unit levels. 5 improvement and development of operations and results. 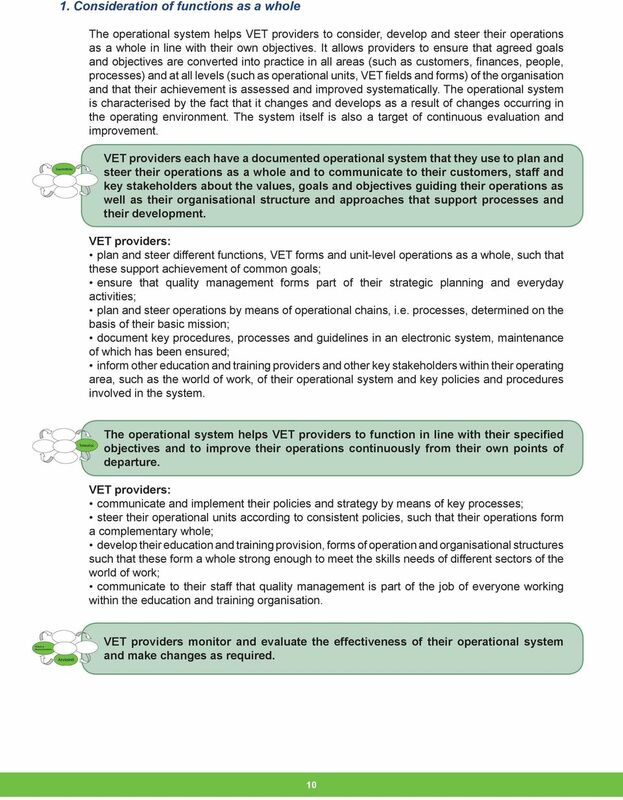 Quality management is an integral part of a VET provider s operational system, thus being linked to all functions and levels within the organisation. The national quality management system in vocational education and training The quality of vocational education and training is assured and improved by means of many different mechanisms. 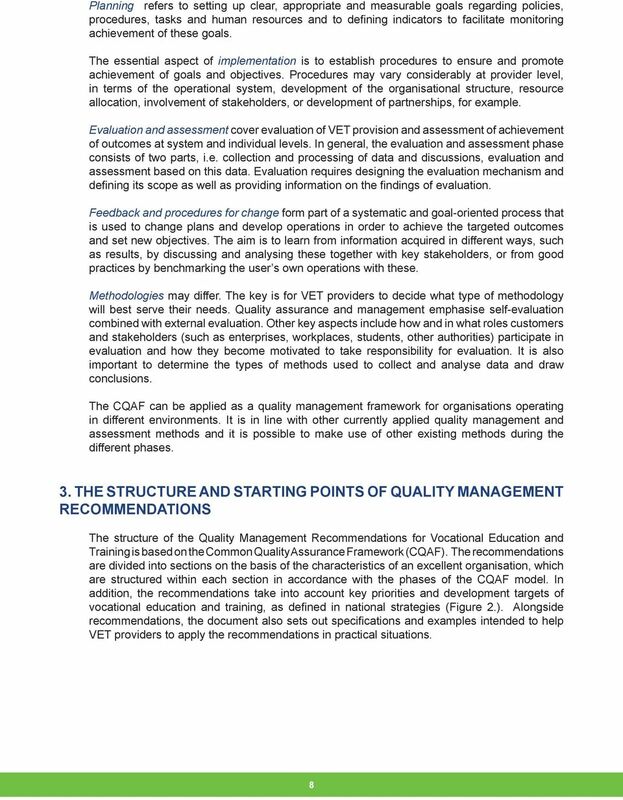 In Finland, the national quality management system in vocational education and training can be divided into three main elements: national steering of VET, quality management of VET providers and external evaluation of VET. International policies and mechanisms relating to quality assurance, such as the European Union s Common Quality Assurance Framework (CQAF), play more and more of a role in development of quality management at both national and provider levels. 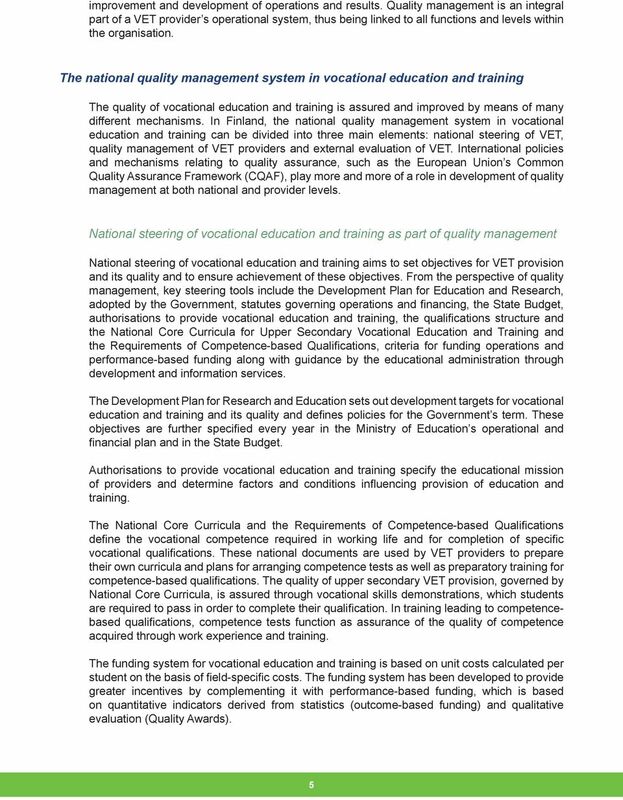 National steering of vocational education and training as part of quality management National steering of vocational education and training aims to set objectives for VET provision and its quality and to ensure achievement of these objectives. From the perspective of quality management, key steering tools include the Development Plan for Education and Research, adopted by the Government, statutes governing operations and financing, the State Budget, authorisations to provide vocational education and training, the qualifications structure and the National Core Curricula for Upper Secondary Vocational Education and Training and the Requirements of Competence-based Qualifications, criteria for funding operations and performance-based funding along with guidance by the educational administration through development and information services. The Development Plan for Research and Education sets out development targets for vocational education and training and its quality and defines policies for the Government s term. These objectives are further specified every year in the Ministry of Education s operational and financial plan and in the State Budget. Authorisations to provide vocational education and training specify the educational mission of providers and determine factors and conditions influencing provision of education and training. The National Core Curricula and the Requirements of Competence-based Qualifications define the vocational competence required in working life and for completion of specific vocational qualifications. These national documents are used by VET providers to prepare their own curricula and plans for arranging competence tests as well as preparatory training for competence-based qualifications. The quality of upper secondary VET provision, governed by National Core Curricula, is assured through vocational skills demonstrations, which students are required to pass in order to complete their qualification. In training leading to competencebased qualifications, competence tests function as assurance of the quality of competence acquired through work experience and training. The funding system for vocational education and training is based on unit costs calculated per student on the basis of field-specific costs. The funding system has been developed to provide greater incentives by complementing it with performance-based funding, which is based on quantitative indicators derived from statistics (outcome-based funding) and qualitative evaluation (Quality Awards). 8 Planning refers to setting up clear, appropriate and measurable goals regarding policies, procedures, tasks and human resources and to defining indicators to facilitate monitoring achievement of these goals. The essential aspect of implementation is to establish procedures to ensure and promote achievement of goals and objectives. Procedures may vary considerably at provider level, in terms of the operational system, development of the organisational structure, resource allocation, involvement of stakeholders, or development of partnerships, for example. 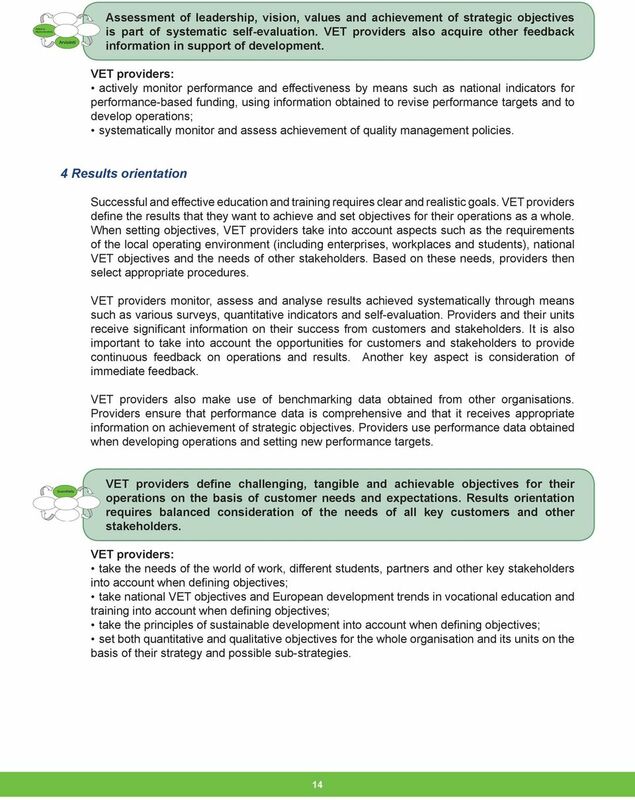 Evaluation and assessment cover evaluation of VET provision and assessment of achievement of outcomes at system and individual levels. In general, the evaluation and assessment phase consists of two parts, i.e. collection and processing of data and discussions, evaluation and assessment based on this data. Evaluation requires designing the evaluation mechanism and defining its scope as well as providing information on the findings of evaluation. Feedback and procedures for change form part of a systematic and goal-oriented process that is used to change plans and develop operations in order to achieve the targeted outcomes and set new objectives. The aim is to learn from information acquired in different ways, such as results, by discussing and analysing these together with key stakeholders, or from good practices by benchmarking the user s own operations with these. Methodologies may differ. 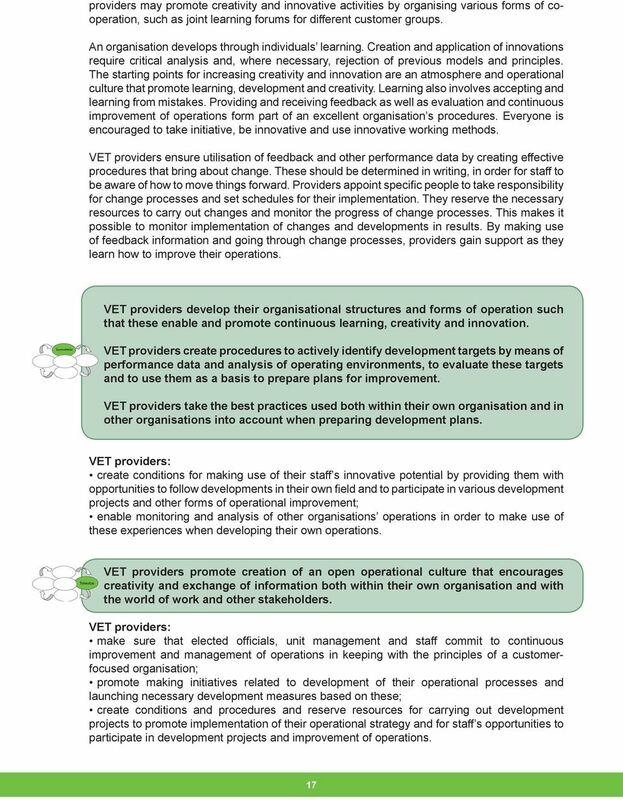 The key is for VET providers to decide what type of methodology will best serve their needs. Quality assurance and management emphasise self-evaluation combined with external evaluation. Other key aspects include how and in what roles customers and stakeholders (such as enterprises, workplaces, students, other authorities) participate in evaluation and how they become motivated to take responsibility for evaluation. It is also important to determine the types of methods used to collect and analyse data and draw conclusions. 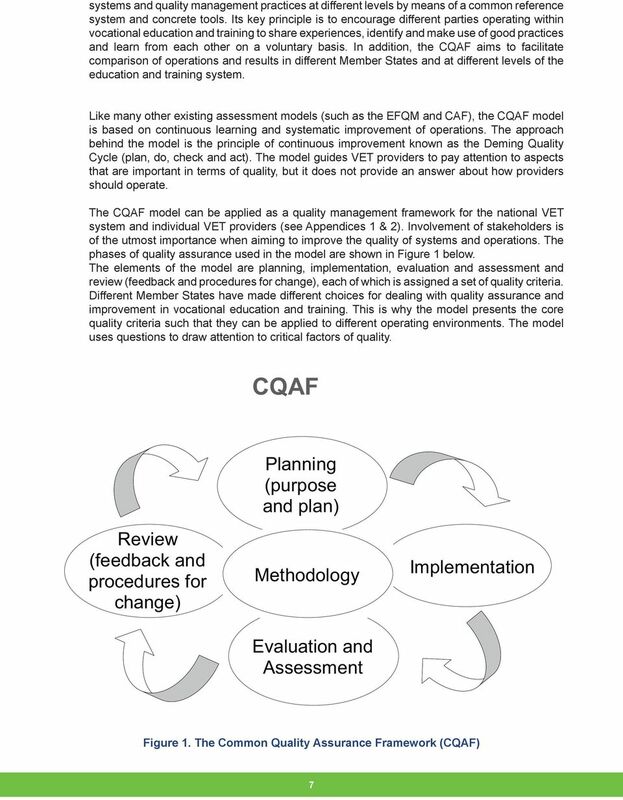 The CQAF can be applied as a quality management framework for organisations operating in different environments. It is in line with other currently applied quality management and assessment methods and it is possible to make use of other existing methods during the different phases. 3. THE STRUCTURE AND STARTING POINTS OF QUALITY MANAGEMENT RECOMMENDATIONS The structure of the Quality Management Recommendations for Vocational Education and Training is based on the Common Quality Assurance Framework (CQAF). The recommendations are divided into sections on the basis of the characteristics of an excellent organisation, which are structured within each section in accordance with the phases of the CQAF model. 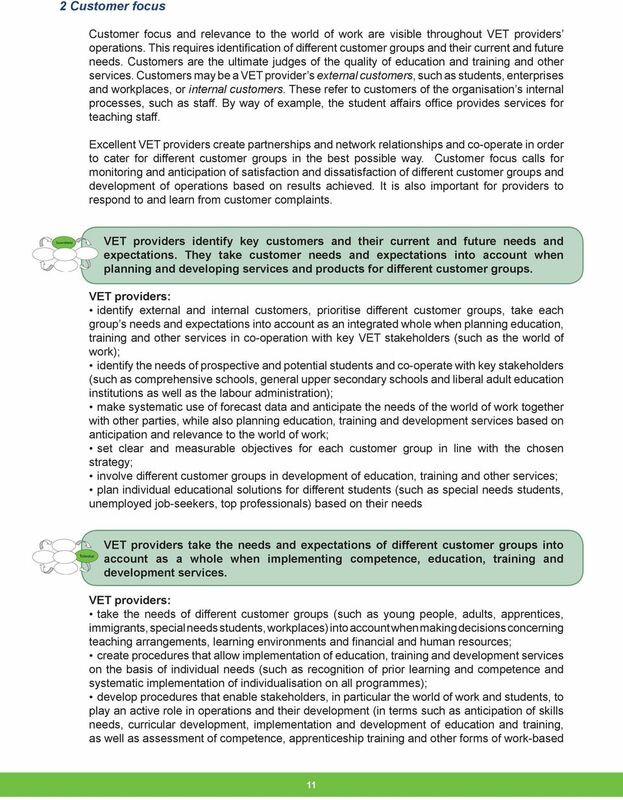 In addition, the recommendations take into account key priorities and development targets of vocational education and training, as defined in national strategies (Figure 2.). 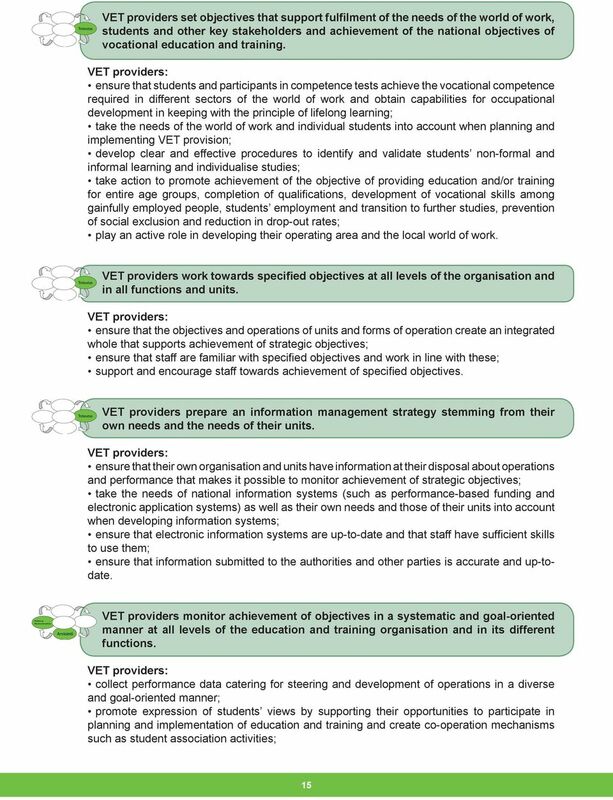 Alongside recommendations, the document also sets out specifications and examples intended to help VET providers to apply the recommendations in practical situations. 9 EDUCATION AND TRAINING POLICY DEFINITIONS AND PRIORITIES NATIONAL STEERING OF VET RECOMMENDATIONS GENERAL BASIS OF QUALITY MANAGEMENT The Common Quality Assurance Framework (CQAF) - planning - implementation - evaluation and assessment - review (feedback and procedures for change) Characteristics of excellence - holistic approach - customer focus - leadership - results orientation - continuous learning, innovation and improvement - people as resources - effective processes - relevance to the world of work and partnerships - social responsibility - evaluation and assessment Figure 2. Structure of the Quality Assurance Recommendations The Common Quality Assurance Framework and the characteristics of excellence form the general basis for quality management and continuous improvement of operations. 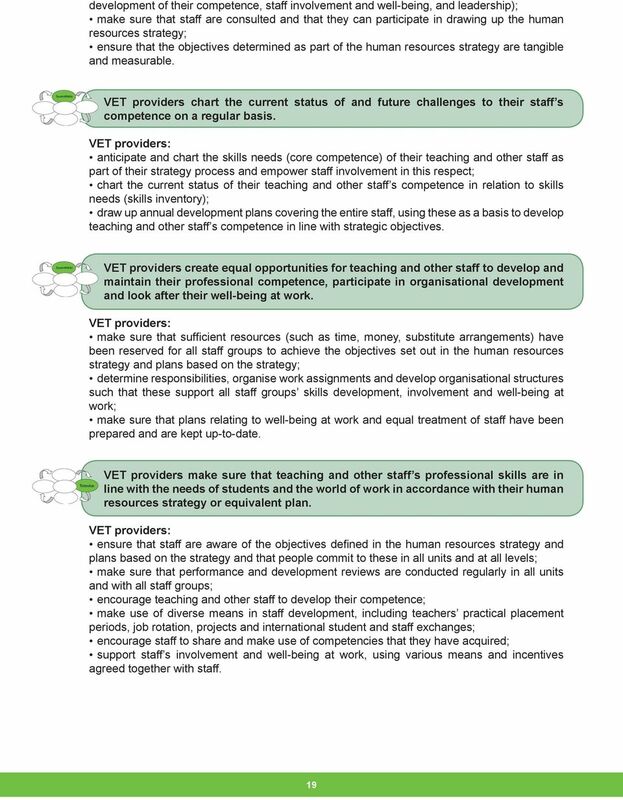 Education and training policy definitions and priorities allow the document to raise development targets and objectives considered as being nationally essential to VET development. 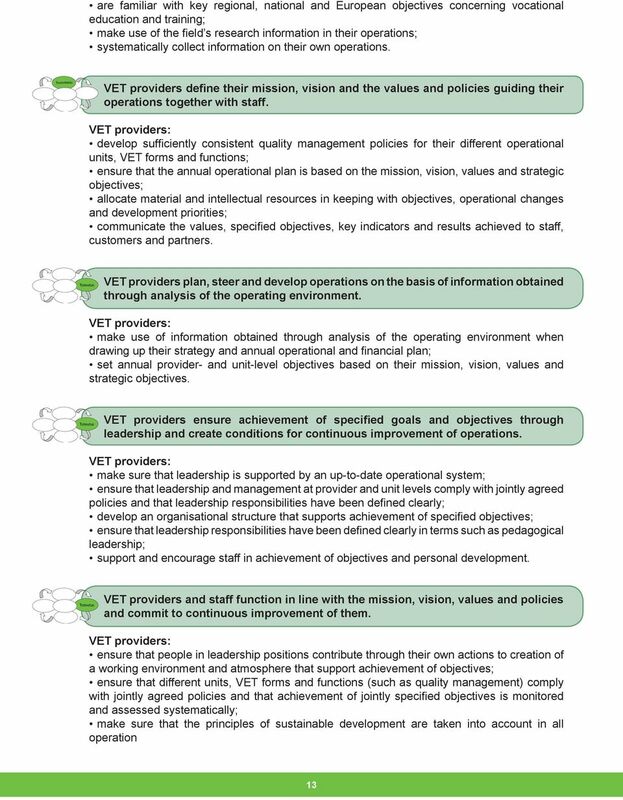 The recommendations are primarily designed to guide the operations and development work of VET providers and their units, but they often pose challenges for other parties responsible for the quality of education and training as well. Each provider decides the appropriate ways to implement the recommendations in practical terms. This requires co-operation with other parties within its operating area. 4. RECOMMENDATIONS The recommendations below are divided into sections on the basis of the characteristics of an excellent organisation. 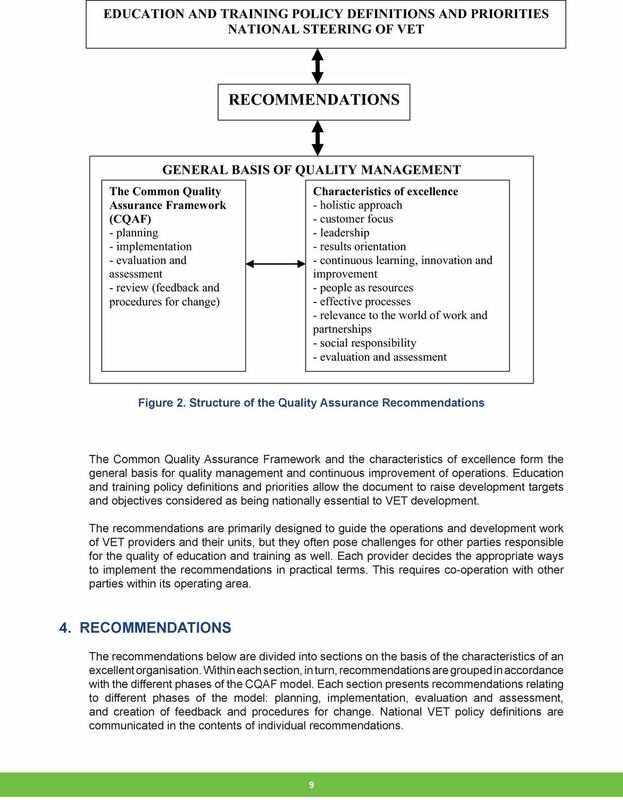 Within each section, in turn, recommendations are grouped in accordance with the different phases of the CQAF model. Each section presents recommendations relating to different phases of the model: planning, implementation, evaluation and assessment, and creation of feedback and procedures for change. National VET policy definitions are communicated in the contents of individual recommendations. How Good is Our Council? Delegations will find attached the text of the above conclusions as adopted at the Education, Youth and Culture Council on 21 November 2008. EBD #10.9 2013-2014 TO: ALA Executive Board RE: Revised Standards for Accreditation of Master s Programs in Library and Information Studies ACTION REQUESTED/INFORMATION/REPORT: For information purposes. GUIDING PRINCIPLES WHAT IS WORKFORCE DEVELOPMENT?